Well, I've been super busy getting new yarn ready for you! First, the Crystal and Tachyon sales continue, and the discounts only get deeper! Crystal is now 20% off with the code "CrystalClear"
All my colors that have at least one skein of Crystal available are listed here. Tachyon is now 15% off with the code "Tachyon"
All my colors that have at least one skein of Tachyon are here. You can only use one code per transaction, but if you'd like to order both bases, just place two separate orders and I will combine them and refund your shipping. Also, I only have four skeins of Force left, at 25% retail. No code needed, the discount is already applied. I've got two new isomers for you this week! 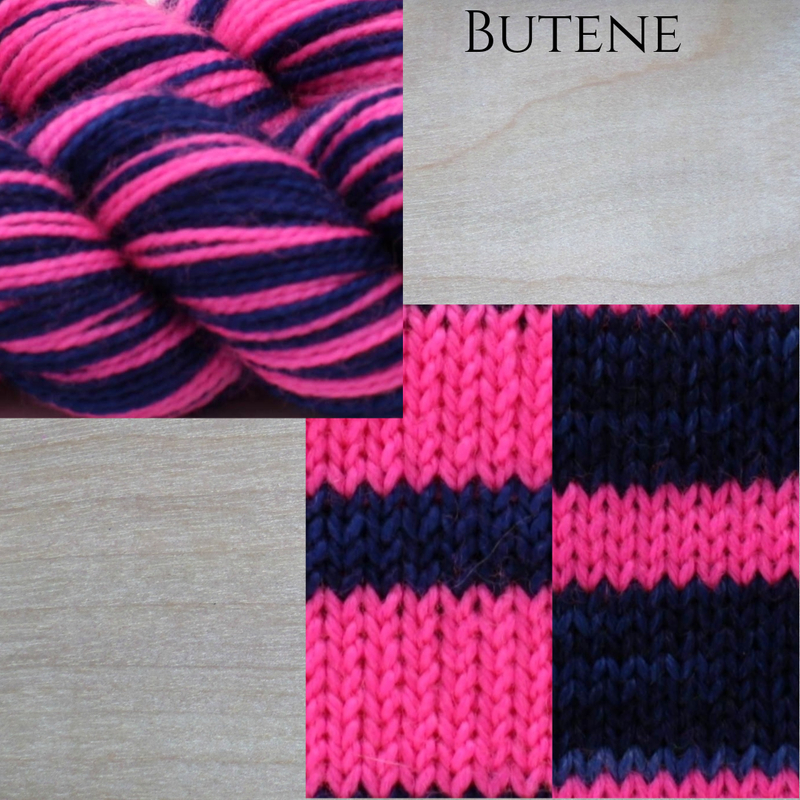 The first one is Butene, which has 7 rows midnight blue, 3 rows fuchsia on one half and 7 rows fuchsia, 3 rows midnight blue on the other half. Isomer colorways come in two 50g hanks that coordinate but DO NOT MATCH. If you'd like to make matchy socks wtih an isomer colorway, why not try knitting the legs of both socks with one skein and the feet with the other to make cool inverse socks? I have sock sets in this colorway here. You can choose either fuchsia, midnight blue, or BOTH for your heel colors for most bases. Butene, also known as butylene, is a series of alkenes with the general formula C4H8. Among the molecules which have the chemical formula C4H8 four isomers are alkenes. All four of these hydrocarbons have four carbon atoms and one double bond in their molecules, but have different chemical structures. 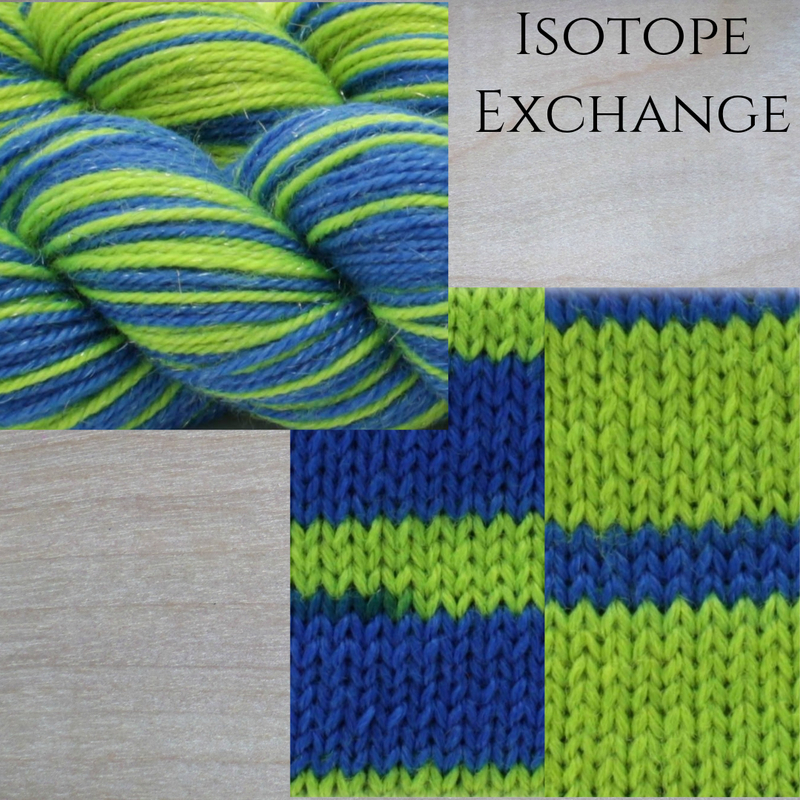 The second new isomer is Isotope Exchange. This one has 7 rows extreme blue, 3 rows radioactive on half the skein and 7 rows radioactive, 3 rows extreme blue on the other half. Sock sets are available here. Isotope Exchange is a process in which two atoms belonging to different isotopes of the same element exchange valency states or locations in the same molecule or different molecules. Are you a beer lover? From pale ales to dark porters, Fermentation has all the colors of your favorite brews. It has 6 rows each pale tan, gold, copper, chestnut and bistre. Fermentation is the chemical breakdown of a substance by bacteria, yeasts, or other microorganisms, typically involving effervescence and the giving off of heat. 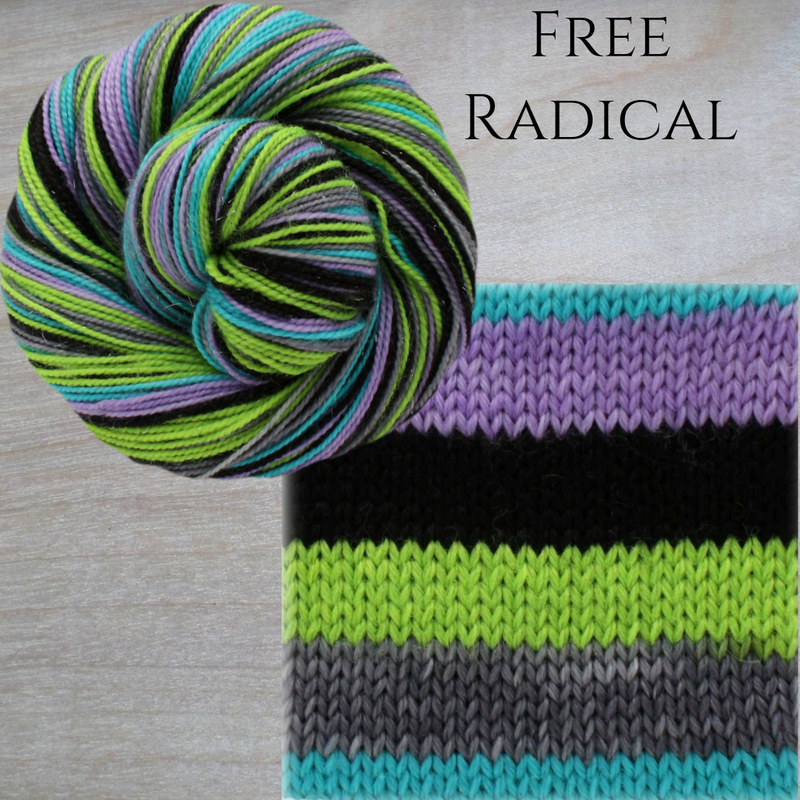 Next up is Free Radical, another even stripey with 6 rows aqua, pale violet, black, radioactive and grey. A free radical is an uncharged molecule (typically highly reactive and short-lived) having an unpaired valence electron. I have skeins of this colorway here. For heels, I have black, pale violet, aqua, and grey. 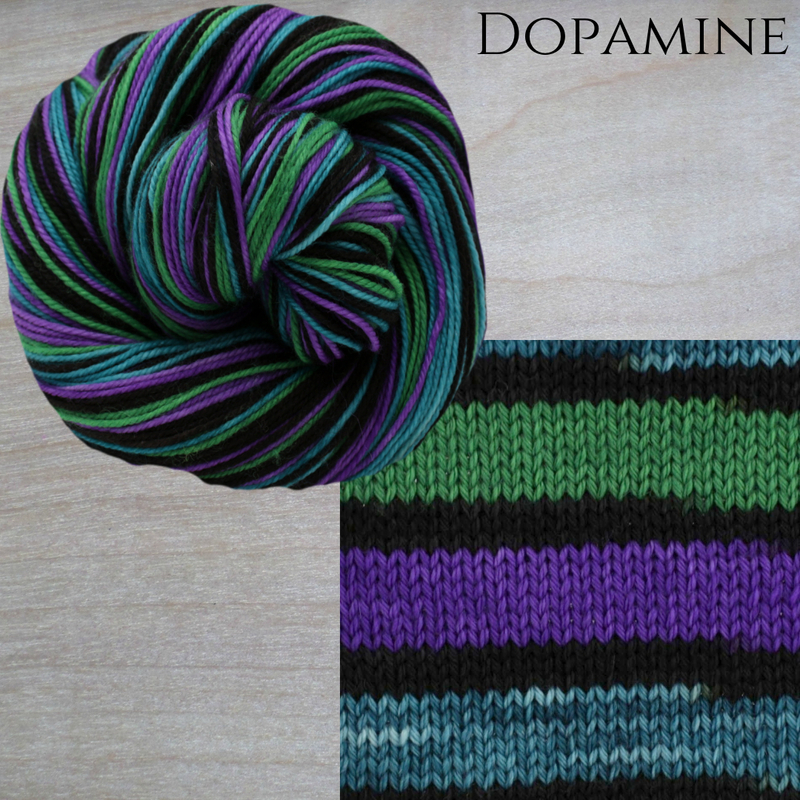 I've added a few more skeins of Dopamine to the shop this week as well. It is a complex stripey with 7 rows violet, 3 rows black, 7 rows teal, 3 rows black, 7 rows green, 3 rows black. Dopamine (DA, a contraction of 3,4-dihydroxyphenethylamine) is an organic chemical of the catecholamine and phenethylamine families that plays several important roles in the brain and body. In the brain, dopamine functions as a neurotransmitter—a chemical released by neurons (nerve cells) to send signals to other nerve cells. The brain includes several distinct dopamine pathways, one of which plays a major role in the motivational component of reward-motivated behavior. The anticipation of most types of rewards increases the level of dopamine in the brain, and many addictive drugs increase dopamine release or block its reuptake into neurons following release. Other brain dopamine pathways are involved in motor control and in controlling the release of various hormones. 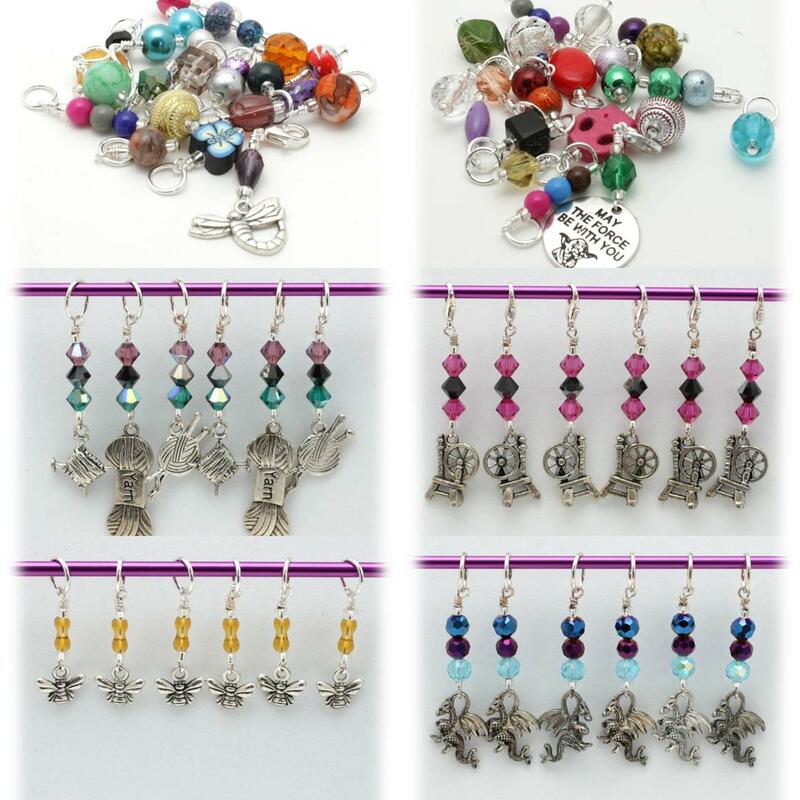 I've got new stitch markers up in the shop! The top two photos are something new I'm trying--Mystery Packs!! If you've bought my yarn before, you know I include a small ring stitch marker with every skein. If you like those (and I hope you do! ), you can buy bulk packages of those markers now! In each mystery pack, you get 19 randomly selected small ring markers (fits up to a US 8 needle) as well as one random progress keeper on a lobster claw for just $16! You can see all the markers here. Do you love self striping yarn but get tired of socks? Do you have a colorway that you just can't bear to put in your socks? What about a sweater? 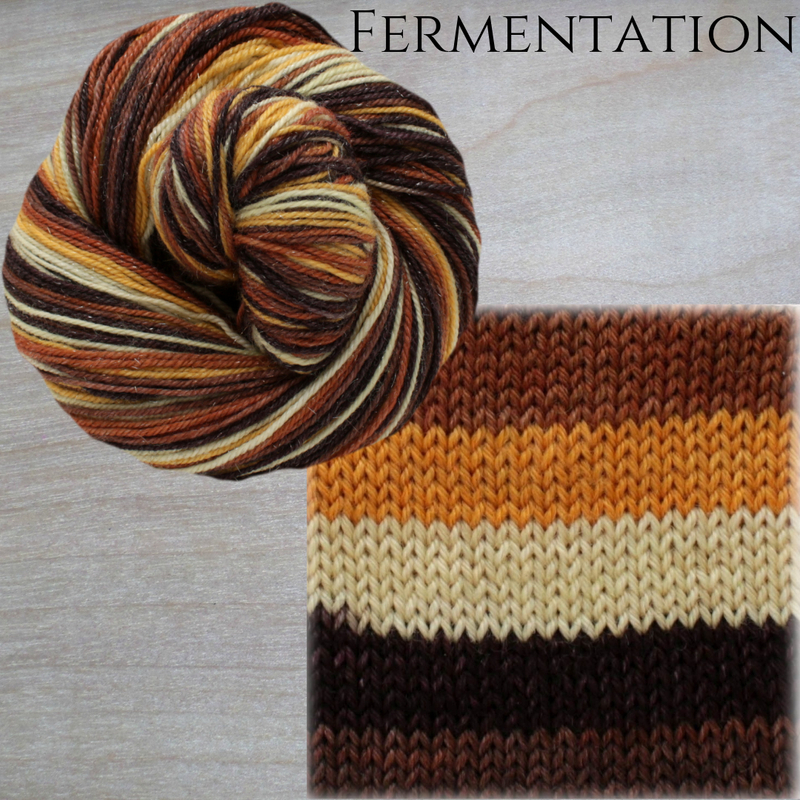 I know, self striping sweater doesn't seem like it would work, but check out Sock Arms! It's a sweater with self striping sleeves and a solid or speckled body. There's a kid version of this sweater as well that I think my eldest needs.